walk in interview and Merit in qualifying exam. for this VSSC Graduate Apprentices vacancies. Walk in interviews will be conducted on 30-11-2018 and 01-12-2018. 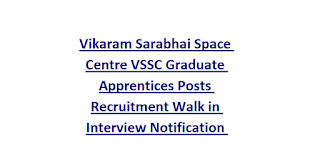 Walk in interview will be conducted in Chennai by VSSC board of Apprenticeship Training BOAT. 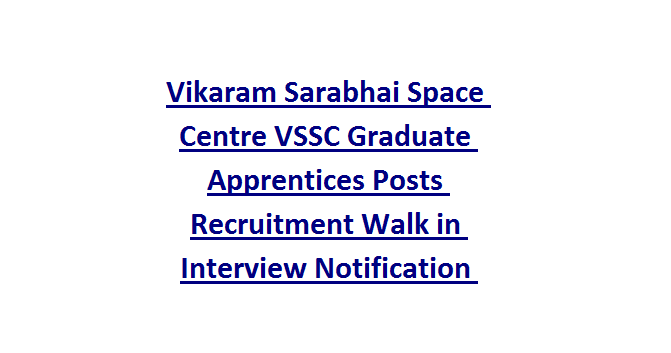 Detailed information about this VSSC Graduate Apprentices recruitment is given below. Walk in interview Venue: Bishop Jerome Institute & School of Management, Kollam, Kerala. There are total 173 vacancies in this VSSC Graduate Apprentices recruitment. As on 14-12-2018 upper age limit is 30 years. For OBC-33 years and for SC/ST 35 years. B.E /B.Tech in respective engineering is required for this VSSC Graduate Apprenticeship Program. Based on merit in B.E or B.tech candidates will be selected. Candidates have to attend the walk in interview as per given dates. Those who are unable to attend the interview they can send the application form to VSSC on or before 01-12-2018.